Royalty free photos uomo dietro closeup. You can use them for business and personal purposes. Images uomo dietro closeup is available 24/7. Buy unlimited royalty free licenses. Standard image license uomo dietro closeup is suitable for your advertisement, on website, on packages, leaflets, printed ads etc. Extended royalty free license uomo dietro closeup is suitable for you products. Are you not sure what type of license do you need? See the simple decision table standard or extended lincense of an image. 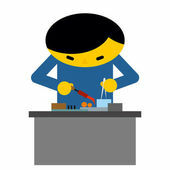 vector Man behind desk repairs electronic equipment. Engineer in workpl Man behind desk repairs electronic equipment. Engineer in workplace. Chinese factory at work.